Amazing how fast Christmas Break is speeding by! I mean, already half gone! Wow. And have I actually generated new pages for the WIP manuscript on which I intended to make progress? Well . . . no. I must admit, no. On the other hand! I bred one of my girls three days before Christmas and one two days after Christmas! So, whew, glad that’s over. The tornado in Mobile, AL? I am sorry for anybody whose house got flattened, but for me, the important thing is the weather didn’t stop Fed Ex from delivering the stud dog’s, um, contribution. Winter does add a little more excitement to getting all these things arranged. So, but! That’s all done. 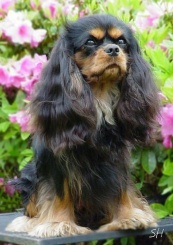 Just as a Gosh-Wow-Don’t-They-Just-Look-Artificial, here’s Teddy, the dog I choose for Kenya. His full name is CKCSC and AKC Ch Truluv Kiss N Tell at Jayba. And here’s The Prez, Adora’s long-distance boyfriend. Seriously, aren’t they both so cute they really do look artificial? Plus, they’re both around eight and have all their health certifications in order — I’m looking forward (with luck) to beautiful, healthy, glamorous puppies that will live practically forever and will certainly not suffer from MVD, mitral valve defect, which is the bane of the breed. A month or so until I know whether the girls caught, and in the meantime, I should be a WHOLE LOT less distracted. I do expect to be revising one . . . or maybe two . . . manuscripts again. Hopefully not in a major way, hopefully nothing that will take too long. But you know what? Even if I do need another round of revisions, I am GOING TO WRITE SOMETHING NEW FIRST. I am sick and tired of revisions. New pages! That is the antidote to writing boredom. Or so I expect. Fifty pages in fifteen days: that shouldn’t be too hard. Okay! Hope the rest of you are having either relaxing or productive Christmases, whichever you prefer.